The article by Fixsen and Blase (this issue) provides a clear roadmap for how to scale up behavior analytic procedures for successful dissemination and implementation. The authors outline the steps taken and lessons learned in achieving large-scale implementation through strategies such as focusing on fidelity, replication, and larger units of analysis with a well-defined set of procedures and programs. Identifying factors that affect successful dissemination and implementation is critically important to ensure decades of careful research have maximum impact on providers, policies, and, ultimately, public health. Yet, there may be multiple pathways to success and exploring other strategies can broaden the range of methods from which to choose. American Psychological Association (APA) (2016). Psychological treatments. Division 12. Retrieved from https://www.div12.org/treatments/. 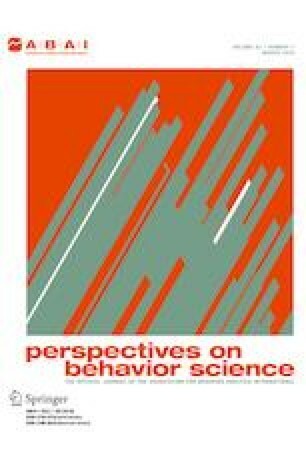 Association for Contextual Behavioral Science (ACBS) (2018). ACT randomized controlled trials since 1986. Retrieved from https://contextualscience.org/ACT_Randomized_Controlled_Trials. Substance Abuse & Mental Health Services Administration (SAMHSA). (2010). Acceptance and Commitment Therapy. Retrieved from https://nrepp.samhsa.gov/Legacy/ViewIntervention.aspx?id=191.